The Couchbase Data Model provides a lightweight, flexible schema; which can be progressively evolved by applications, over time. An individual document often represents a single instance of an object in application code. 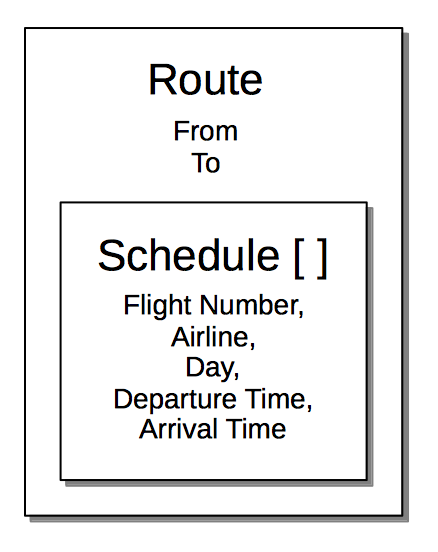 A document might be considered equivalent to a row in a relational table; with each of the document’s attributes being equivalent to a column. Couchbase, however, provides greater flexibility than relational databases, in that it can store JSON documents with varied schemas. Documents can contain nested structures. This allows developers to express many-to-many relationships without requiring a reference or junction table; and is naturally expressive of hierarchical data. Thus, in the document model, each document can be highly self-contained. This supports the rapid fulfillment of application-requests, and has important implications for both scalability and latency: one document can be replicated, or atomically changed, without other documents needing to be accessed; eradicating the need for complex inter-node coordination, and minimizing contention. In the document model, a schema is the result of an application’s structuring of its documents: schemas are entirely defined and managed by applications. A document’s structure consists of its inner arrangement of attribute-value pairs. The definition of a small number of rich documents, each embedding complex information, may sometimes be appropriate: in order to group together properties typically accessed or written at the same time. This potentially allows information to be read or written in a single operation; atomicity to be improved, due to the simultaneous occurrence of mutations; and scalability to be enhanced, due to the existence of fewer relations between independent objects. It may also allow the grouped properties to be more easily maintained in a state of mutual consistency. The definition of a large number of simple documents, each of which refers to others, may be appropriate when access-patterns are predictable, and data-size needs to be kept small, in order to reduce network-bandwidth consumption. Documents can refer to each other by key. Note that Couchbase Server provides atomicity, consistency, isolation, and durability on operations that address a single document. Thus, a single write is guaranteed either fully to succeed or to fail: no operation results in a partially updated version of the document. Moreover, if an update operation imposes durability requirements — say, for replicated or persisted durability — the whole document is guaranteed to be durable.